The recently founded Dutch Vietnam Smart Horticulture platform helps the horticultural industry in Vietnam to become more professional. Members of this platform pool their capacities and skills to provide answers to questions, expertise, and investments and in doing so they contribute to the further development of the Vietnamese horticultural and floricultural industry. This includes the entire horticultural chain from seeds to consumer. It is not only about production, post-harvest, and sales but also about aspects like legally sound contracts, landscape designs, and training. 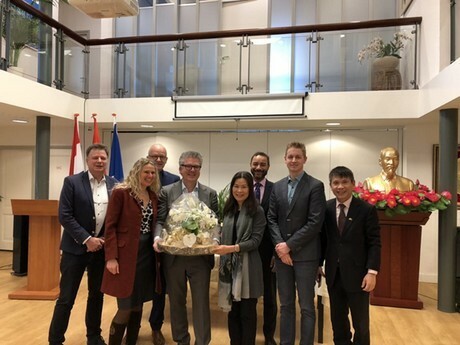 Initiators and members of the platform are Axia Vegetable Seeds, Onings Holland Flower bulbs, Wageningen Food and Biobased Research, Van der Valk Horti Systems, Kneppelhout & Korthals Lawyers, Kuiper Companions, the Dutch Vietnamese Chamber of Commerce, NL.IN.BUSINESS and Kenlog. Kenlog will act as a mediator within the platform. “We have been active in Vietnam for about seven years now. Among other things, we have founded a training center in Sa Déc, advised a producer of cashews, helped with the founding of a cutter for vegetables in Hanoi, helped with the implementation of quality management systems as well as assignments regarding the professionalization of lily cultivation and helped in the setting up of 500 hectares for a horticultural project. We have also guided Vietnamese ministers and ambassadors when they visited the Westland in the Netherlands. As a Dutch company and institution, you need to have a good relationship with the Vietnamese embassy and governments to get things done over there. It is great that the Vietnamese are direct and like to push ahead. You do need to make sure that there is transparency in everything you do”, says Van Eijk. Onings Holland Flower bulbs are a renowned bulbs and tubers exporter. The family-run company has been around for 65 years and has made quite the name for itself in the exporting of lily bulbs. As a member of the new platform, Onings wants to gain more from the present potential Vietnamese lily market. “In many areas, there is room for improvements. We would like to market and spread our knowledge in areas like production and techniques among others, over there”, says area manager Paul Onings. The platform will gather again at the end of February to decide on a business plan and a corresponding strategy. The idea is to create a formalized platform with Dutch and Vietnamese entrepreneurs and institutions. They will become the architects and builders of the collaboration. This platform takes on the task of realizing horticultural chain or question-based projects. For each project, separate consortia will be made.